Rivers United star, Frederick Obomate, has applauded the commitment of the club’s official front-of-shirt sponsor, Eunisell. Obomate, was one of the players who joined the club from Sharks, which firstly benefited from Eunisell’s front-of-shirt sponsorship, in 2015. Eunisell has since become a significant part of Rivers United’s history as first-ever front of shirt sponsor. Interestingly, he was one of the players who modelled Eunisell’s launch of the sponsorship, in Lagos. “Eunisell deserves to be praised for their commitment to Rivers United. 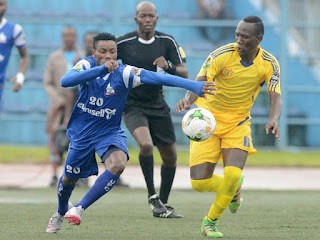 “Despite the relegation of Sharks, Eunisell remained with Rivers State and moved the sponsorship to Rivers United. This is unparalleled. “I was in Lagos for the launch and witnessed the event live. Eunisell have been sincere from what I witnessed during the unveiling. “It is a way of motivating the team and we will justify the confidence reposed in us,” he said. Obomate scored the club’s second goal during the Caf Confederation Cup victory over Ugandan side, Kampala City Council Authority.